Miamon Miller - AMANites.. lets stay connected! 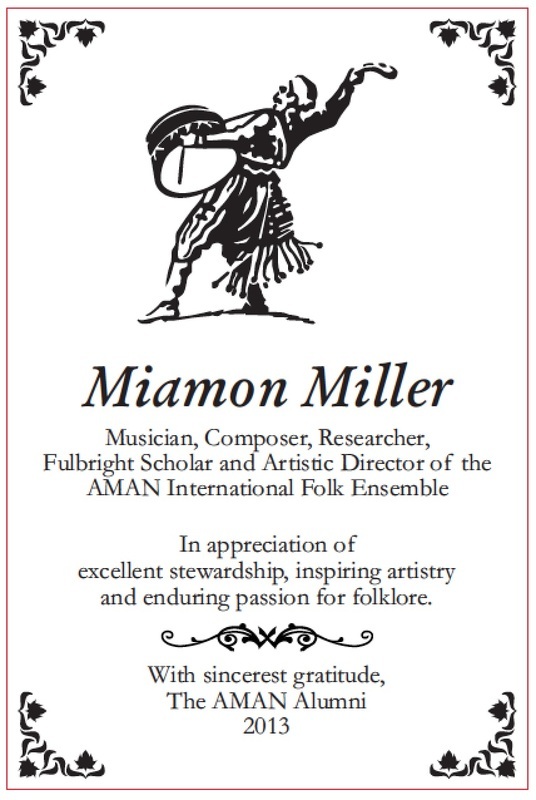 Miamon began his musical career as a classical violinist but became entranced with the world of folk music, joining the AMAN Folk Ensemble in the 1970s and later becoming its Artistic Director. He studied ethnomusicology at UCLA, earning an MBA and ABD whilst playing mariachi music in his spare time. He was awarded a Fulbright scholarship and spent a year living in Romania, studying Transylvanian folk music. Miamon is widely experienced in mainstream music and has re-corded with many well-known artists including Neil Sedaka and Neil Diamond. He has also composed and arranged music for film and tele-vision productions ranging from Dr. Quinn, Medicine Woman to Arabs in Detroit, And Starring Pancho Villa as Himself, Keeping Up With the Steins and the PBS documentary Swimming in Auschwitz. He has also composed for theater, most recently the score for the Polish Białystocki Teatr Lalek (Białystok’s enormously popular puppet theater) produc-tion Czarne Ptacki Białegostoku (The Black Birds of Białystok).